What’s supposed to be wrong with my Umbagog? That’s the question going through my head while smoking this cigar, the second Broadleaf-wrapped smoke created by Steve Saka for his Dunbarton Tobacco & Trust portfolio. The reason that question came to mind wasn’t that I didn’t enjoy the cigar—I did—but that Saka created the bundled cigar to use Broadleaf wrapper deemed too “ugly” for his premium Mi Quireda line. The name, which refers to Saka’s favorite fishing spot, Umbagog Lake, implies this is a cigar to smoke while fishing or anytime when you may not be too concerned with the aesthetics of your cigar. Beyond the wrapper, Saka has said this cigar isn’t exactly the same blend as Mi Querida, though it’s very similar. Think slightly different primings or grades of tobacco but the same basic Nicaraguan components, all out of the same factory (NACSA) in Estelí, Nicaragua. Seven sizes are listed. I smoked four of the Toro Toro vitola (6 x 52) for this review. The Toro Toro is heavy on the spice and earth with charred oak, chocolate milk, and white pepper that lingers on the palate. Umbagog is full-bodied with a thick, powdery mouthfeel. There are only slight variations from start to finish, including a building wood spice. Visually, while Umbagog may not be top-grade, the construction is nonetheless excellent. The draw is firm but not tight, and the cigar burns evenly leaving a sturdy ash in its wake. 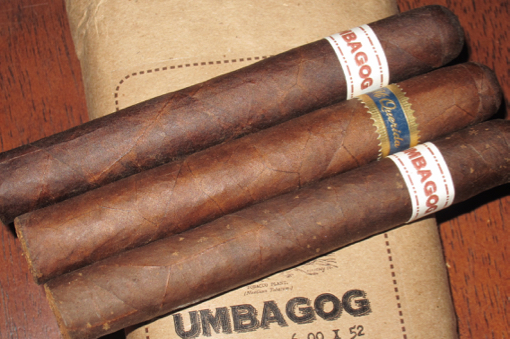 Umbagog’s flavors are not as refined as Mi Quireda, and its appearance is almost purposely unrefined, but it is plenty tasty and is offered at an excellent value ($60 for a bundle of ten). All of which earns the cigar a hearty recommendation and a rating of four stogies out of five. Where can you even find these at? One major online retailer had them for sale briefly (as an item you could backorder), but has since taken them off their site. I haven’t seen them pop up anywhere else since. I’m speculating here, but I suspect he wanted to establish it on the market for FDA purposes. In terms of the capacity at NACSA as long as he has top-grade broadleaf wrapper available, from a monetary standpoint it makes sense have to make his more premium Mi Querida rather than Umbagog which presumably has lower profit margins, especially while Mi Querida is selling well. The lower grade wrappers can be put aside for when there is extra capacity. Umbagog will become more widely available in the very near future. First will be a small batch of Umbagog “Misfits” – these are identical cigars, but due to a bonehead mistake on my part they were shipped to the US without bundle labels and maybe bands. I am not sure because in order to check I would have to open all the bundles and to be honest, it just isn’t worth it… anyhow these we be sold at an even lower price. The next batch will be available in early February – same ugly cigars, but with the correct rings and labels. On the profit margin question – way lower, nearly zero – it really doesn’t cost significantly less to make an Umbagog vs a Mi Querida. The reason I am doing it is to protect the costing and quality of wrapper on the Mi Querida line – since I own the tobacco I must find an acceptable way to use the less aesthetically pleasing materials or destroy them – better to cash recover than lose is my approach.